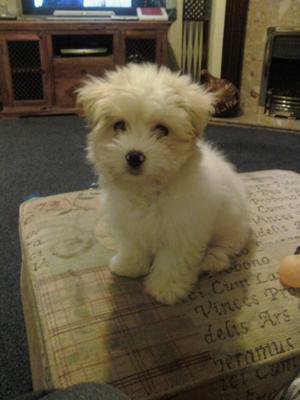 My Coton de Tulear, Brucy is the funniest dog I have ever had. He is so smart and learns very fast. He can be very stubborn at times, But he is so funny with it. He will sit and look at you when you say to come. But then you can see his face change as if to say "if it will keep you happy" than he will come over. He is alway so happy and loving. He is very social. He loves to be around people as well as other dogs. He is only 12 weeks old at the moment. But with all his love and lauphter, we are enjoying every min. of the day we spend together. My Tuffy does that too! He always needs to let me know he does have a mind of his own, he can be sweetly stubborn but always loving. Brucy is just adorable. The Coton really is a joy and you'll find that it just gets better and better. Thanks for sharing Brucy with us.